We pride ourselves on the quality of our food and we like to think we offer something a little different. Below you will see our evening menu, everyday we have specials so make sure you take a look at our Specials Board before ordering. New Years Eve – 6pm-1:30am (Food – 6pm-8:30pm) Fireworks at midnight! All Other days will be open as usual. Pizza’s available every evening, baked to perfection by a passionate, and talented chef called Mo. All from fresh produce. The Green Dragon 5th Annual Beer Festival 2017! 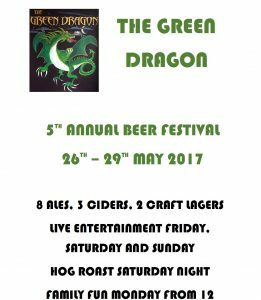 The Green Dragon Ryhall 5th Annual Beer Festival 26th-29th May 2017. 8 Ales, 3 Ciders, 2 Craft Lagers, live entertainment on Friday, Saturday and Sunday! We have a Hog Roast on Saturday night and family fun on Monday from 12.